The privatization of prisons has been a total train wreck. Even though the crime rate is - from what I have read - at an all-time low, our prisons are crammed full of people serving outlandishly long sentences for non-violent crimes, or just because they are too poor to pay their bail or even their debts. The entire system is disgusting, it needs a complete over-haul. Thank God! Some good news for the prisoners. AniMae C. says it all. Aramark sells to schools?! Oh, my! And, while I agree with JL's above comment, I still wonder if the "new" food provider might be financially "in bed" with the prison. Sometimes, a company will dump one corporation because another has come along (or been created) to work hand-in-hand to maximize profits for both. And, I agree with all the above comments that the prison system is broken. Privatization always hurts everyone except those profiting in the system we now live with. No, it wasn't always this way, though. I just keep hoping that as Obama's term nears its end, he will release all who are imprisoned for non-violent drug offenses. Yes, the bail system is also rotten to the core. Don't get me started on the cash cow prison system. It starts with the phone call, @ $12.00 to initiate the first call, and gets progressively worse. You can't get an indigent package, which contains soap, toothpaste, shampoo, until you have been there 30 days. REALLY? 30 days with no toiletries. It's a joke. Thanks everyone. I'm afraid it's going to be slow going in changing this rotten system. There is too much money in it, and there is so much corruption involved. The public are ill-informed about these issues. Many people don't care about prisoners, who tend to be poor, mentally ill, or developmentally disabled. After Obama pardons every prisoner in jail for pot possession, these hell holes will go out of business. animal abusers/rapists/child molesters should get food that rats have sampled first. Yuk, that's absolutely disgusting and shouldn't have been possible. 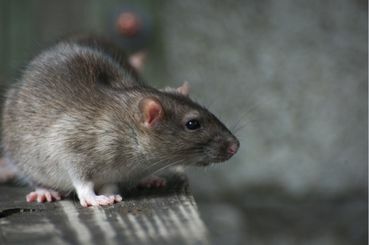 The only pleasant thing about the article was the pretty picture of the rat.